For just €10 per session, we offer a safe and comfortable environment conducive to learning, where students are assisted and encouraged to make the most effective use of their time. For up-to-date details and to access the application form, please check the "News" section. The Julian Walton Winter Lecture Series takes place every January for a 10 week period. Every Thursday night, Julian and a selection of guest speakers outline the history and events of the community, county and region. Lectures cost €5 and include question time and refreshments after the lecture. Julian has completed nine lecture series to date, covering all topics from the history of the Powers of Dunhill Castle, to Thomas Francis Meagher to the Blueshirt movement locally. Julian is always interested in hearing from patrons who wish to hear about a particular topic and he starts planning the next lecture series almost immediately after the last one finishes! As Dunhill Multi-Education Centre receives funding under the Pobal Community Services Programme, we maintain number of public and heritage sites locally, such as Reisk Medieval Graveyard, Boatstrand, Dunhill graveyard and other sites locally. As part of our commitment to the local community, Dunhill Multi-Education Centre provides an extensive library of books of all genres for borrowing or reading in the quiet confines of the library. We are happy to arrange local volunteers to drop off and collect books if you are housebound. Give us a call on 051 396934 and we'll tell you the kind of titles we have available, or arrange for a selection to be delivered within the parish if you cannot get to us. Don't forget we are fully wheelchair accessible if that helps! Parents, minders or grandparents are all welcome to join our parent and toddler group! Come and enjoy a cup of tea or coffee while your child plays! As part of our ongoing commitment to the community, please remember our facilities are available free of charge for community & voluntary groups. We endeavour to bring a number of information services and clinics to the local community when available. Please don't hesitate to contact us if you are involved in a local community group and wish to avail of free meeting space. We also assist with publicising community events via our own social media sites and in conjunction with the Dunhill-Fenor Parish notes. If there is an information event you wish to bring to the local community, please speak with Marie Cox or Sharon O'Hanlon in the Centre. Here within the Dunhill Ecopark, we have a Community Garden, maintained by our Pobal Community Services Programme team, and operating in part as a training garden for students within the centre undertaking relevant courses. Please talk to us if you would like to investigate growing some produce in the garden or tunnels. In the meantime, the garden and wetlands provide a lovely peaceful and relaxed environment to sit and reflect, study or just be. Reisk graveyard was the burial place of the local community for many centuries. There are the ruins of a medieval church with a carved head over the chancel arch. The headstones around it date mainly from the 18th and 19thcenturies, with a few from the 20th. Some have decorative carving showing the symbols of Our Lord’s Passion; these are often found in graveyards of the Waterford area, but those of Reisk are the finest examples of the work of our 18th-century local stonecutters. There is also a headstone with a unique carving of the expulsion of Adam and Eve from the Garden of Eden. The tomb of the O’Sullivans of Ballylegat, a Catholic gentry family that had escaped the Cromwellian confiscations, dates from the 1730s and bears their coat of arms. 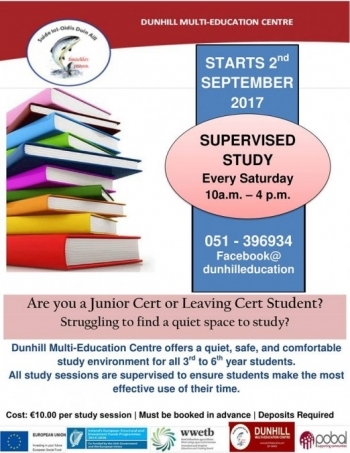 Dunhill Multi-Education Centre is delighted to provide a regular practice area for the fantastic Dunhill Fenor Special Olympics Motor Activity Group - the group are always on the lookout for new volunteers to keep this organisation running for the benefit of all children involved. Contact us for details if you feel you could provide some free time on Saturdays to help out!